If you are thinking of getting African Grey Parrots as pets, then here are some African Grey Parrot facts that may interest you. African Grey Parrots as pets are one of the most popular choices, and it is no wonder as they have huge personalities. They learn to talk easily and can learn to do numerous tricks. A lot of people believe that African Grey Parrots are the most intelligent parrot species. This is one of those African Grey parrot facts that I can’t answer with a definite yes or no answer. An African Grey is a medium-sized bird, originating from central Africa. Here is a very entertaining video of a highly intelligent and well trained African Grey Parrot. Why are African Greys So Clumsy? African Grey parrots should always be allowed to fully fledge before having their wings cut for the first time. If this is not done, the parrot looks clumsy and often develops insecurities later on in its lifespan. Although they have a sort of clumsy look about them, they can be ever so graceful in both flight and landing ability, provided the wing clipping is not done too early in its life. Do African Greys Only Bond With One Person? An African Grey does tend to have a favourite person, but he can bond with many different people. As long as the entire family handles him and pays attention to him, this shouldn’t be a problem at all. Why Won’t My Bird Talk? If you are getting a bird primarily for the sake of it being able to talk, don’t do it. While most of them do, in time, learn to talk, there are a few that will never utter a single word. Both Male and Female birds have equal talking ability. The average Grey starts to talk between 12 and 18 months. A couple here and there have been heard talking at as young as 6 months and others talk a lot later. There are no hard and fast rules. Most African Grey Parrots will start by mumbling and practising words that they hear when they are on their own, and then suddenly surprise their owners by saying the word perfectly all of a sudden one day. In most cases, a single bird will talk a lot more than if you had two or more birds together, but there are also exceptions to this rule. Why Is My Parrot Neurotic? Neurotic-type behaviours are formed from stress, insecurities, fears and lack of confidence. If you think about it, most parrots are hardwired to flee from danger. We automatically expect it to understand all the strange things in its environment without the security of its flock. Coupled with the fact that wild Congo grey babies remain with the family unit much longer to develop emotionally than they do in the domestic pet trade today. Timneh Greys don’t normally have as many issues, as they mature a lot quicker than Congo Greys. African greys also have a reputation for being fearful of new things introduced into their environment. While this often is true, it is possible for an African grey parrot to accept change if done gently and gradually. Funnily, the more intelligent the bird is, the more likely it will have behaviour problems unless it is worked with. If a baby grey is not properly socialised to humans at an early age, it may become confused and not know how to behave. What Is A Red-Tailed Grey Parrot? The red-tailed grey parrot is simply another name for the African Grey Parrot. Who Was The Most Famous African Grey Parrot? Alex is known as the most famous African Grey Parrot. In 1977 Dr Irene Pepperberg bought him from a pet store. She wanted to prove to the world that parrots were more than just mimics. She worked with him for thirty years, and Alex showed amazing cognitive skills. He was able to name more than 100 objects, actions and colours. Sadly Alex passed away in 2007. Why Is My Parrot Aggressive? One of the well-known African Grey Parrot facts is that if they are left alone, they become aggressive and self-destructive (feather plucking). In captivity make sure they are always given lots of attention or engaged in some form of activity. How Long Do African Grey Parrots Live? These birds are long-lived parrots; the lifespan ranges from 73 to 93 years in the wild. However, in captivity, the average lifespan of African grey parrots is 50 to 60 years. What Cage Size Would An African Grey Parrot Need? The cage on the left, as you can see from the above measurements is a good size to have. The more spacious the cage, the better and the happier your bird will be. The parrot should be able to open his wings out fully and be able to turn around without any of his feathers touching the sides of the cage. If you want to see more examples of cages, just click on the picture, or visit this page. 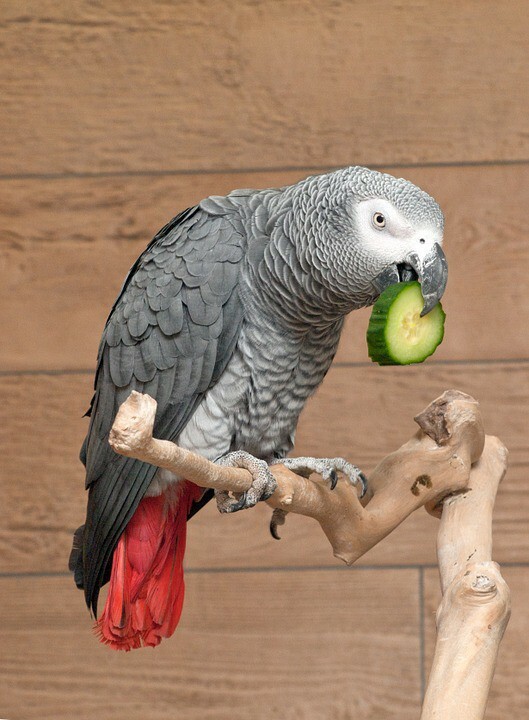 What Do African Grey Parrots Eat? In the wild, these types of parrots predominantly feed on fruits, nuts, seeds, palm nuts. Apart from these nutrients, they also feed on snails and other protein-rich vegetarian diet. If you’ve got one of these parrots then feed those varieties of foodstuffs rather than always providing the same diet. To see more types of food that can be purchased online, click on the picture to the right. What Shouldn’t You Feed Them? Caffeine, Sugar, Chocolate, Peach and Cherry pips, Apple seeds, Avocado, Anything exposed to chemicals, fertilisers and artificial dyes. What Is The Fastest Way To Your African Grey Parrots Heart? Another one of those African Grey parrot facts that I have to include is how to make your parrot warm to you and trust you. A trusting bird is a confident bird with fewer issues in the long run. Greys, like men, love food. Use treats as your training basis, in the beginning, to gain his trust, and then, later on, to reward him if he does well in his training. What Are Reasons I Shouldn’t Get An African Grey Parrot? Don’t get an African Grey if you are away from home a lot and the bird has no company. If you are not prepared to devote the next 60 years of your life to him. If you are not prepared to give him lots of love and attention every day. If you can’t afford vet bills if he gets sick. If you don’t like loud noises. If you don’t like small naughty children. What Do I Need To Purchase Initially? Travel cage like the one below, as you never know when you will need to transport him or move him out of the house in a hurry eg fire. And of course, a parrot to complete the above picture. To find out more about travel cages, click on the link above or on the pic. If you have any further African Grey Parrot facts to add, please feel free to comment below. I wish I could have an African Grey Parrot as I always wanted one. Unfortunately I travel a lot and am gone a majority of the time. I am not sure any of my friends or family share my same passion for birds as I do. Maybe some day soon things will change for me and I can make the first step into owning one. Yes it is difficult to own a parrot or any pet for that matter if you go away a lot. Maybe you will be in a better position to own one later in your life, and have more time to enjoy him. Well organize header and elaboration. Distinctive headline and informative content. I wonder if African Grey Parrots are very difficult to train? I have never had one, been tempted, but wondered if I would manage the training part of it all. Also how much time would you recommend I spend with my parrot each day? Thanks for stopping by Ian. I wouldn’t get an African Grey Parrot unless you have time to spend with it and train it. If you leave it on its own often and for a long time, he can get stressed. If you have other people in the house that also give it attention then great. The more time you spend with your bird, the easier it will be to train, and the more time you spend with him the more time you will want too. Thats was really a fun post and video to watch. Great one to share with animal overs everywhere. That spaceship was awesome! As far as a pet, I’m sure one like this will make a great one. 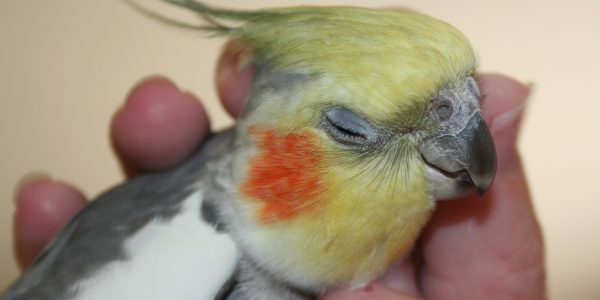 Is any kind of formal training though needed to get those kind of real results from the Cockatiel? Although cockatiel’s are very intelligent in their own way, I haven’t seen a cockatiel do what this African Grey can do. I don’t know of any formal training available offhand, but there are plenty of resources that can be purchased online that can help you to train your bird to be the best that it can be. The best way to train a bird is do it yourself and spend time with him, unless it has problems that need the help of a specialist. I love watching their genius at work.